Picture this, you and your spouse had a child or children not so many months ago and are already out of the infant stage. How your child is old enough to walk and even talk but not yet old enough to attend school. So the next logical thing to do is to look for a good preschool in a Singapore location that is convenient for you. By now you have already realized that having a child is an expensive affair. However, it’s not about to get any easier given that sometime soon your child will have to go to school which means more expenses. But expenses aside, you should be thinking about preparing them for school. Preschool is the obvious way to go not only because it will prepare your child for school but also because it will allow some free time for other activities such as work. You should consider taking your child to a preschool so that you can take advantage of their developing brain. The human brain develops at a very rapid pace, especially during the first three years. They absorb things faster during this stage, thus making it the best time to start imparting knowledge on your children. Taking children through preschool at this early stage will, therefore, help stimulate their minds. Although choosing to take your child to a preschool sounds like a good idea, but the cost is something to consider. Preschool fees can get quite expensive, but the fees may differ depending on the preschool you choose. Below are some of the most affordable options you can choose from and their price comparisons. 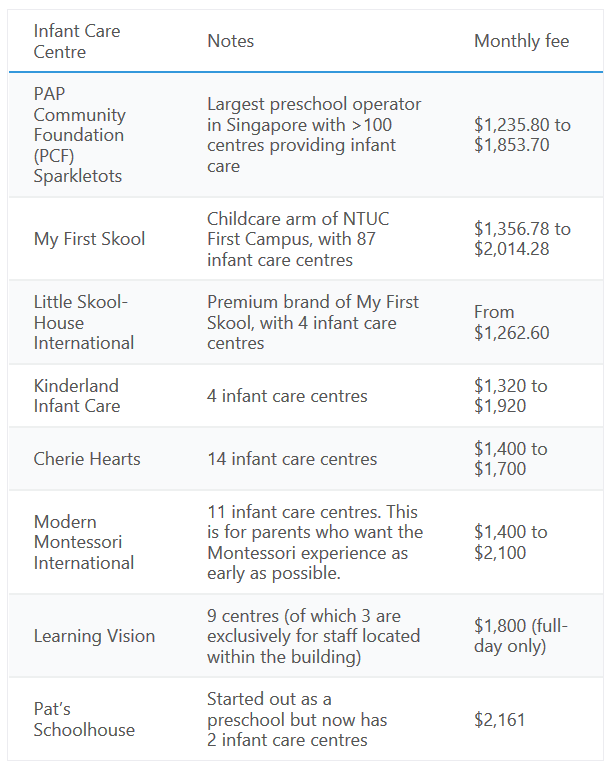 PCF Sparkletots and NTUC My First Skool are the most affordable preschools in the above list. They also happen to be the largest child care centers in Singapore and have affiliations with the country’s government. PCF charges roughly $770.40 per month while NTUC’s fees range from $712.21 to $1,112.27 per month. The beauty of the above two preschools is that they have about 200 centers combined that are distributed across the country. This makes it easier for parents to find one that is conveniently around their location. Private preschools that are owned by individuals or private organizations are more expensive just as is the case with regular private schools. Most of them charge monthly fees above $1,000 per month. They often charge higher fees because they offer special programs. If you can afford such amounts, then go for it by all means because you cannot put a price on good exposure and a good education. There are many more private preschools that are available in Singapore. Below are some of the examples and the monthly fees they charge. Carpe Diem Childcare- estimated monthly fee is $1,284. Cherie Hearts- $1,000 estimated monthly fee. Mindchamps- $1,800 estimated monthly fee. Kinderland Child Care Centres-$1,400 estimated monthly fee. EtonHouse- estimated monthly fee starts from $1,800. Chiltern House- Charges over $2,000 per month. Pat’s Schoolhouse- Charges roughly $1,979.50 per month. Little Village on the Grange- Charges over $4,290.70 per month. Singapore also has various Montessori centers whose monthly fees range from around $800 to over $2,000. Montessori centers offer an education system that focuses on developing natural activities and interests instead of following the regular teaching norm. Montessori centers in Singapore may exist as individual centers that are not all owned by the same entity or individual. It is also a common thing that numerous religious groups in Singapore also operate preschools. These schools usually have religious programs where they teach religious values. The good thing about most religious group-based preschools is that they tend to be less expensive with the average monthly fees around $1,000. Below are some examples of such preschools. Although preschools are a great idea, they are not the only options that parents may opt for. You might want to impart unique skills through enrichment programs. Below are some of the programs you might consider that are easily available in Singapore. These are much more affordable than preschools but are less comprehensive compared to what your child may learn from a preschool. You might end up paying between $50 and $350 per month for any of the programs, and this may include materials and equipment for the specific task. Although the cost of preschool is high in Singapore, there is a way to afford it without much of a hassle. The Singapore government has schemes that are designed to help Singapore parents lower the cost of bringing up their children. All Singapore parents have access to a monetary incentive when they open a Child Development Account (CDA) for their child. The program provides $8,000 or $10,000 in cash as well as a $3,000 grant. It also matches the amount in each CDA on a dollar-for-dollar basis. Parents who have more children receive more of the bonus. This childcare subsidy is provided to Singapore parents whose children are enrolled in child care or infant care preschools that have an ECDA license. Below is a chart demonstrating the available basic childcare subsidies. Needy Singapore parents receive up to $540 additional child subsidy which is designated for infant care and $440 designated for child care. However, numerous qualifications have to be fulfilled for Singapore parents to qualify or these subsidies. 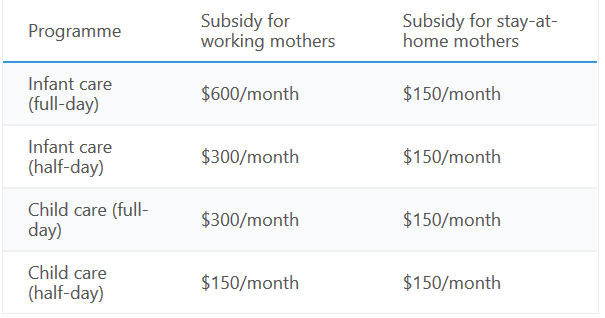 These subsidies are available to those whose family per capita income is below $1,875 per month. Qualifiers may also be single moms or dads who work for more than 56 hours per month. Those with $7,500 or less monthly household income may also be eligible. The above subsidies may help to significantly offset some of the costs that Singapore parents incur when taking their children through preschool thus making it more affordable.